And recent surveys have shown that her popularity overall, while still strong, has begun to fade. In one, a Fox News-Opinion Dynamics poll, her net positive rating shrunk from 27 points in early September to 11 points a week ago. At the same time, the candidate has been widely perceived to have struggled through a pair of TV interviews, particularly the recent one with Katie Couric of CBS. Her positive rating shrinks/is shrinking/will shrink. Her positive rating shrank. Her positive rating has shrunk. I am 16, and I am 4'11''. I am very passionate about modeling. However, there are not many places looking for short girls. I was wondering if there are some certain places that deal more with my type of look. I have a proportionate, petite body. But I just need some help! It seems that anyone in search for a model, is looking for someone over 5'7''. She means aspiring, of course. We're sure, though, that the inspirational story of a tiny teen with towering dreams will be the next reality-show craze. Don't let anyone steal your dreams, you miniature models and knee-high NBA hopefuls! They're not interchangeable. This is from a headline that appeared in our local paper. Unless the man is growing porcelain, this headline should read "Chinese farmer sentenced for faked rare tiger photos." One of our former classmates posted this picture she'd taken at a protest of the National Day of Silence to honor gay, lesbian and transgendered students at her local high school. 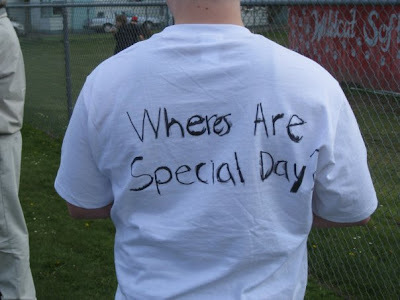 Apparently, some children who haven't experienced the suffering that's commonplace among kids who don't belong to the heterosexual majority think they deserve a "special day," too. We completely agree with the boy in this T-shirt. Therefore, we designate this day as the National Day of Reckoning for People Who Write Ungrammatical Things on T-Shirts Using Sharpies, Even Though Their Handwriting Is Pretty Awful. Congratulations, you sad clown. We salute you. Gwyneth Paltrow has a new, um, product/brand/metaphysical experience called GOOP. We don't know why all the letters are capitalized. It's not an acronym. So we can only assume she means to shout it from the rooftops. GOOP! GOOP, everyone! GOOP! Anyway, she's encouraging people to "nourish the inner aspect." You can do this when you cook dinner for someone, visit a new city, or "workout and stick with it." Thanks, Gwyneth, but we will work out. We will stick with our workout. And we will mind the space bar. We still have no idea what the inner aspect is, and what sort of food it likes. Everyday means ordinary. We ar-ar-are-are-are Everyday People. We love Overstock.com, but we think they should spend a little more money on an editor. * So sorry if you don't like Elvis Costello or Sly and the Family Stone. We can't help ourselves. We believe the word the author intended was peddled. But some of these financial products were innovative, so who knows? Perhaps they had wheels. Of no small appeal to the network was that the idea for “Opportunity Knocks” was pitched by the actor Ashton Kutcher, whose credits as a reality-show producer include MTV’s “Punk’d” (“Candid Camera” essentially reimagined with attitude, and celebrities) and CW’s “Beauty and the Geek” (nerds paired with pinup models, with each, ideally, improving the lot of the other). The network liked that the idea came from the actor Ashton Kutcher, who produced other "reality" shows, including MTV's "Punked," a "Candid Camera" update, and CW's "Beauty and the Geek," which paired models with nerds. The passive voice and parenthetical asides really muddy the waters in this particular example. Passive voice isn't always bad, though. Sometimes, the subject is less important than the object and the action. For example, "The man was charged with murder." You could say "The prosecutor charged the man with murder," but if the prosecutor isn't really important, then you'd use the passive voice to shine the attention on the man. The passive voice can be sneaky, though. Cake was eaten. Mistakes were made. Lives were lost. Who did it? And why is no one taking responsibility? To quote Milton-Bradley (or was it Hasbro? ): "Pretty sneaky, sis." Jan Freeman has a nice piece on Boston.com about "the quiet generosity of the semicolon." While such words would be a dream come true to some, what we liked best were the description of how to use a semicolon, and the example of where one was used in a monument instead of a comma. Does this make us nerdy? Or just very excited for the upcoming National Punctuation Day? And if anyone has doubts, authorities quickly put an end to them. The state news media often makes examples of people who fail to move out — and who are killed or injured. We get how it would be annoying and all to have your citizens ignore sensible advice from the government. But is killing off scofflaws the way to proceed? Of course, it's possible that authorities are putting an end to the doubts, and not the Cubans. You just can't tell, though, from the way these two sentences are written. The article itself says residents of the low country have been warned they "face certain death." Apparently the editor thought no one could predict such things, and inserted the "could" there to maintain a fair and balanced approach. It does the opposite. The residents were, in fact, warned of the dangers of staying in their houses during the hurricane. This headline turns sense into nonsense. Is anyone else utterly dismayed at the state of our wimpypants media, so afraid of errors or perceived bias they will edit the sense out of everything? In any case, we have a newsflash: Each one of us faces certain death. It's a bummer, but there you have it. Live well! Susan: oh my god. I'm watching Dr. Phil (I know, he's disgusting) and one of the "expert women doctors" he's got on there giving advice just talked about the "stigmata" of getting cervical cancer. Do you even believe? Stigmata: a plural noun that means marks that look like crucifixion wounds. The word she wanted was stigma: the shame attached to something that's socially unacceptable. Barbara's pun was a great one. Hysterical means extremely funny or affected by hysteria--an uncontrollable emotion such as grief. Its root is the Greek word for womb. Hysteria literally means wandering womb. We refrain from casting judgment on long-dead Greeks. Wait, no we don't. Sexist bastards. Easy to "doo"? Perhaps it's a fiber-arts kit that was shelved in the wrong section of the store. In any case, constipation isn't fun at any age. If this kit solve the problem for the 8-and-ups, we're all for it. Was It a Circus Bear? That's a pretty talented bear. Submitted by Raena and Chuck, who will each receive a T-shirt from the SPOGG shop. Nancy and Julie will receive handsome plastic SPOGG membership cards. Thank you, everyone, for playing. Our copy editor contest is still running. Please visit Things That Make Us [Sic] and click the "contest" link for more information. The Nashville News found a funny typo on a sausage wrapper, using it an excuse to slip in a filthy punctuation-based joke. Equally funny are the jokes in the comments section. Bravo! Jim sends along the following photo. Please note the announcement in the lower right-hand corner: "VEGETARIAN FED HENS." Does this mean the hens were fed by a vegetarian? Does it mean they dined on vegetarians? Does this really make a difference in the quality of the egg? Are they trying to say the hens that laid the eggs ate vegetables? Then they would be vegetable-fed hens. That's the really crazy thing about language, people. If you use simple words, chances are you can get your meaning across. Also, it's news to us that people have been feeding chickens meat. That is extremely gross, and possibly cruel. Does this taste like chicken to you, Becky Layer? Me, too. I think I'm going to hurl! FRESNO, Calif. -- Authorities say they've arrested a man who broke into the home of two California farmworkers, stole money, rubbed one with spices and whacked the other with a sausage before fleeing. Burrimond says money allegedly stolen was recovered. The New York Times has just written about some of its recent grammar and language gaffes--and the reporter managed to work "hot naked guys" into the piece. We firmly believe that many, if not all, discussions of language are improved thus. Your mileage may vary. Update: Baal D. pointed out that women, according to the Times, actually want "not naked guys." Apparently we saw "hot" where they wrote "not." Freud might have a thing or two to say about that. At any rate, "not-naked guys" (which should have been hyphenated) are abundant. Are women really so easily pleased? We think...not. Needless to say, we do not regret the error. If there's anything that marks a person as a new or inept speaker of English, it's the misuse of prepositions. For example: There is something wrong of my car (newbie error). Or Where is my car at? (inept usage). David Thatcher calls them "the banana peels of modern speech." He refers, also, to the prepositionally problematic phrase "fooling around on [one's] wife." Even better, he does this with a British accent. Now a retired English professor, he presents a downloadable guide called "Saving Our Prepositions." You can find it here. SPOGG is grateful, delighted, and amused. It's quite good, and almost certainly the only language manual that makes any sort of reference at all to the beauty of the word "gonorrhea." A cup of regualar coffee sounds like the perfect way to start your day. Wouldn't some cheep gas be nice? But if you park your car, you've been warned: No in-and-out priviliges. These mangled spellings – on real-life signs around the Dallas-Fort Worth area – underline the obvious: Spelling isn't always high on our list. And our grammar ain't that good, too. It's enough to make your English teacher cringe – and drive others to break the law. Last month, two men were sentenced to probation and banned from national parks for a year after getting busted for fixing errors on a sign in Grand Canyon National Park. The men travel the country correcting signs as part of the Typo Eradication Advancement League. Across the country and locally, the land is littered with signs, posters, ads, menus – you name it – that are riddled with spelling and grammatical errors. In some cases, human spell-checkers battle these boo-boos by fixing the errors on their own. Others snap pictures and trash the typos on their blogs. Grammarians say these are bad signs of the times – our language is on a downward spiral. Others say: Lighten up. Correct spelling and proper grammar matter and help us understand each other, said Martha Brockenbrough, who founded the Society for the Promotion of Good Grammar. We haven't had time to study this with our Jr. FBI Forensic Foto KitTM, but we are fairly certain this T-shirt says "I may be broke but, I am not flat busted." SPOGG is outraged. The comma should come BEFORE the but, not after. This is every bit as bad as Paris Hilton's "THATS HOT" T-shirt. We're definitely going to protest if the McCain campaign comes to our city. We will hold a big sign with a comma on it, and the warning: BE CAREFUL WHERE YOU PUT THAT THING. We only hope no one thinks the comma is, well, a sperm. We understand the Palin people are a little testy about that topic these days. Karen S. sent this along a few weeks back. It's an announcement for a new company run by the brother of Will Smith, the famous actor. TREYBALL OFFICIALLY LAUNCH'S [sic] LIFESTYLE HOMES DIVISION Treyball Development's President & CEO, Harry Smith [SIC -- missing comma] announced the launch the Lifestyles Homes Division. Details of a formal launch party will be announced shortly for a handful of invited guests, VIP's [sic], and staff. To learn more about the new division and it's [sic] launch EMAIL TREYBALL. If you're going to announce a luxury "lifestyle" division, in which your motto is "luxury is not a privilege, [sic] it is a necessity of life," then you ought to just go ahead and splurge on an editor. Would you trust someone to build your home if his company can't even build a simple sentence? We think not. In 1974, the fire chief of Terre Haute, Indiana, was meeting with his workers at the scene of an overturned tank car, only fifty feet from an Indiana State University dormitory. The situation was tense, because the car was full of vinyl chloride, an extremely explosive subtance. The chief broke the tension, at least for nearby reporters, when he attempted to instruct the men to take a break, and then return to the scene at a specific hour. He announced, "Okay, men, let's circumcise our watches!" Here's one my wife encountered as an assistant professor of mathematics education at St. Mary of the Woods College, also in Terre Haute. The geometry class was working with compasses, when one girl raised her hand. "Professor Eisele, would you please go over that again. How do you circumcise a circle?" she asked. "Very carefully!" she replied, as the other students broke up laughing. Clark’s topic is bearocracy, and shockingly, she doesn’t know what that is! Really, I’m shocked! She asks McKey what it is, and when McKey says she won’t tell her, Clark can’t understand why. Excuse me competitive queen of the world! She has a difficult time during her photo shoot. Jay calls her a “very pretty plastic Barbie,” meaning she never changed her face. - a government run by the mortal enemies of Goldilocks? - a government run by hairy men who like to dress in leather? Here's the rest of the story. Tyra Banks will stab the author with a sharpened mascara wand if she reads it and sees how her name is misspelled. We'd sort of like to watch. Scott wrote to us about two years ago, lamenting a Massachusetts road sign that said "for safety sake." Here's our original post on the subject. I must apologize for the delay in my thanking you for your response to my question about a punctuation error on Massachusetts roadside signs (SPOGG blog: "Massachusetts vs. Shakespeare," June 5, 2006), but at the same time I am thrilled to report that the error has been corrected. As documented by the attached photo, the missing apostrophe and "s" have been restored to the sign, which now reads, correctly, "for safety's sake." Armed with this circumstantial evidence, I have concluded that the corrective power of SPOGG may have played a role in improving at least this one corner of the world. While I'm sure we can all understand the desire to become grammar vigilantes, I'm glad SPOGG exists as an oasis of order in a world in need of proofreading. We have no evidence whatsoever that SPOGG's sincere efforts made a difference. But hey! They couldn't have hurt. Perhaps that should be our unofficial motto: We Might Not Help, But at Least We Don't Hurt. Tesco's motto is "Every little helps." Every little what helps? We don't understand. If you do, please enlighten us at info@spogg.org. "There was a mistake in a recipe for apple cake. Instead of calling for two pinches of nutmeg it said 20 nutmeg nuts were needed," Matmagasinet's chief editor Ulla Cocke told AFP..."We publish 1,200 recipes each year, and of course there have been times when they've had a bit too much butter or too little flour, but we have never experienced anything like this before," Cocke said. Of course, common sense is also a good thing to use when cooking. Twenty nutmeg nuts? That is nuts.